Home » contest, events, The Move	» What’s This Golden Ticket Yarn All About? If you’ve ever been to one of Yarnia’s anniversary parties (typically held in February, in the dead of winter…seems a long way off!) you may already be familiar with our Golden Ticket Yarn. Well this coming Friday, you’ll have the opportunity to shoot for it again at our Grand Reopening Party! 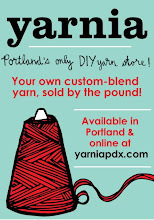 In addition to a sale on all pre-made cones in the store, we’re also going to be winding up 15 cones of a special limited edition blend of yarn. Inside one of these cones will be hidden a “Golden Ticket,” or more specifically, a $30 gift certificate to Yarnia, which can be redeemed for anything you choose — yarn, classes, needles, notions — even used in the online shop! June 27, 2014 | 5:00 – 8:00 p.m.
Don’t Forget, Our 5-Year Anniversary Party is on Saturday! !